"How did dogs become man's best friend? While many scientists once thought that canines evolved from ancient wolves, there are now a number of competing theories. Some are not convinced that the 2 are even different species, a skepticism that reflects broader debates about how to define a species. At the @rbinsmuseum in Brussels, Andrew Testa photographed a 32,000-year-old skull that was discovered in a Belgian cave. 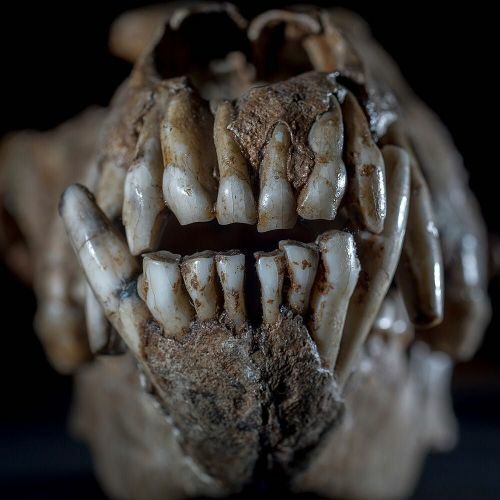 Mietje Germonpré, a paleontologist at @rbinsmuseum, who leans toward the idea that humans intentionally bred dogs from wolves, pointed out the wide skull, crowded teeth and short snout indicate that the ancient toothy creature was not a wolf. Visit the link in our profile to read more." By nytimes on Instagram.